Almonds are a tree nut grown throughout many parts of the world. These nuts are extremely nutritious and contain high amounts of protein, fiber, and healthy fat. Almonds also contain generous concentrations of B vitamins, vitamin E, magnesium, calcium, manganese, and high amounts of beneficial antioxidants. On top of that, almonds are also low in carbohydrates, with only 30 grams per cup, mostly in fiber content. Now, although almonds are approximately 72% fat by weight—a one-cup serving of whole almonds contains approximately 800 calories, with almost 600 of those calories being fat—the fat that almonds contain is considered to be quite healthy. Although almonds are high in fat content, it is mostly of the monounsaturated omega-9 variety. The principal fatty acid contained within almonds is oleic acid, which is found in higher concentrations in olive oil. Research has previously shown that this type of fat has many beneficial health attributes, including the ability to reduce your risk of heart disease. With almonds being an easy food to pack as a nutritious on-the-go snack with huge health impacts, some new reports regarding the health benefits of almonds in particular are worth mentioning. During the recent 2014 session of the American Society of Nutrition scientific meetings, six new studies involving the health benefits of almonds were presented. One such study explored the concept of almonds as the optimal snack. 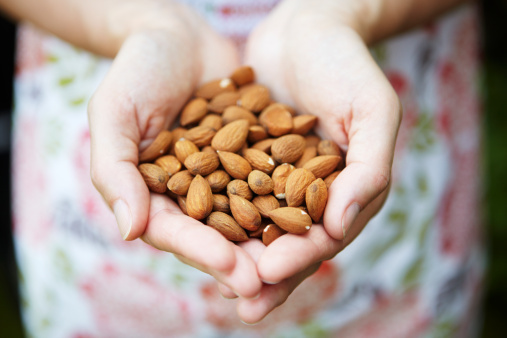 One researcher reported that a study including 24,808 participants indicated that those who consumed almonds were much more likely to also consume more healthy nutrients, experience a better diet quality, and maintain an improved physiological status compared to those who did not consume any almonds. A different study looking at the effects of snacking on almonds in those at higher risk of developing diabetes experienced better control of blood sugar, improved cravings, controlled weight gain, and higher amounts of monounsaturated fat and vitamin E.
A different study looking at the effects of snacking on almonds compared with a different high-sugar snack containing the same number of calories revealed that those snacking on almonds experienced a decrease in waist circumference and abdominal fat mass compared to those eating the sugar-laden snack. Finally, another study indicated the value of almonds in controlling cardiovascular and metabolic risk factors, including a decrease in inflammation, a reduction in appetite, and an improvement in fullness. The new research presented indicates that what was previously understood regarding almonds is definitely true: almonds are low on the glycemic scale; are high in protein (six grams per ounce), fiber (four grams per ounce), and “good” monounsaturated fats (13 g/oz); and are a great source of vitamins and minerals. This can make almonds a very sensible alternative and satisfying, heart-healthy snack choice that can also help to support a healthy weight. “Almonds examined for effects on diet quality, appetite, adiposity and cardiovascular disease risk factors,” Medical News Today web site, April 29, 2014; http://www.medicalnewstoday.com/releases/276010.php. “Nutrition Facts and Analysis for Nuts, almonds,” SELF nutrition data web site; http://nutritiondata.self.com/facts/nut-and-seed-products/3085/2, last accessed April 29, 2014. “Almonds,” The World’s Healthiest Foods web site; http://www.whfoods.com/genpage.php?tname=foodspice&dbid=20, last accessed April 29, 2014.